A better understanding of how gender pay impacts an organisation can help leaders identify new strategies and techniques that can support and develop women across the sector – meaning that organisations like Explore York, which have fewer than the 250 employee threshold for disclosure, are also keen to explore the implications for their own current and future practice. The meeting prompted these four organisations, who are collaborating through a public service mutuals partnership, to identify some key ways that libraries could address their gender pay gaps. An Arts Council England funded project called #UnlimitedValue is helping Libraries Unlimited examine their data and use this to drive change in their organisation. This has led to a willingness to explore data on staff in greater detail than is required by the new regulations on gender pay gaps. For example, finding out how the differentials vary across different regions, libraries, or service subsets might offer greater insights on the areas of the organisation that could be usefully targeted to improve. Reviewing recent recruitment processes, from advert to selection, could offer additional insights in how organisations can make quick changes to address the gender pay gap. Research indicates that unconscious bias is present in job advertisements which might make them more appealing to men, or might cause women to ‘count themselves out’ before they even apply. Posts which deliberately emphasise the service’s values, or clarify flexible working policies might also encourage those with additional domestic responsibilities (according to research, predominantly women) to send in their applications. For all four organisations, being a public service mutual can offer more freedom to innovate and develop a more flexible approach to the recruitment and selection process. This opens up opportunities to broaden the suite of selection tools. Incorporating a shadowing experience as well as an interview, for example, could encourage a more diverse range of candidates to explore what library work is all about. All four library mutuals agreed on the need to provide enhanced development opportunities that enable a more diverse range of staff to transition towards leadership roles. This might include providing opportunities for frontline staff to experience life in other areas of the organisation; hosting staff development days where employees have a chance to learn from one another and share good practice, or mentoring programmes which help managers identify and develop ‘talent’ amongst their workforce. In some organisations, reverse mentoring programmes (where lower-level staff mentor senior leaders) are shown to have an impact on gender differentials at work. 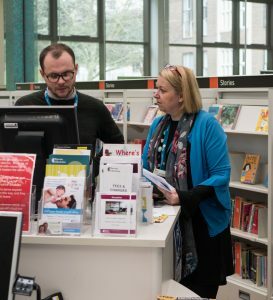 At Libraries Unlimited, a recent staff development programme enabled library supervisors to regularly connect and share their ideas for service improvements through an action learning set. 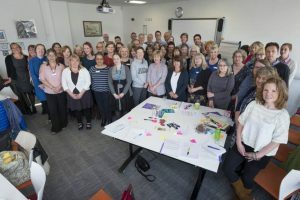 This has resulted in a greater sense ofconnectedness to the organisation as a whole and Libraries Unlimited are now looking at ways of implementing similar programmes for staff at other levels of the organisation. What if the stats don’t look perfect? The most fundamental aspect, according to Peter Gaw, is the desire to learn from the experience of library services with gender pay gaps in order to launch an open and transparent discussion in support of sectoral change. This entry was posted in Uncategorized by Beverley Claire Hawkins. Bookmark the permalink.